Starting off, I’d very much like to say thank you to all the comments and contributions from fellow JKT fans in Part 1 of the guide to watching JKT48 especially about the Ojek. bus system and f(x) recommendations. For this next part, I would also like to share more tips about things you can do at fX and the theater. fX Sudirman (or sometimes known as fX Senayan to taxi drivers) is the shopping center that houses the JKT48 theater. It is a classy place with more than 7 floors for your shopping and entertainment needs and it also houses a hotel. Yet, the number 1 most appealing thing to me is that you can receive free wi-fi. as long as you are in the shopping center. To access it, just turn on your wifi and input “fxsudirman” for the login id and password at the login page, but, in case these have changed, you can just ask for the wifi password at the reception counter at level 1. After applying for a ticket, applicants who win a ticket will often be informed by email and their application status will also be updated as “Menang undian ticket” in the “My Page” menu of the JKT48.com site. Ticket collection starts 2.5 hours before the show, until an hour before the show starts. So, if you win a ticket for a 2pm show, ticket collection hours would be from 11:30am to 1pm (and 4:30pm to 6pm for a 7pm show). All ticket collection and payment happens at the ticket booth, and the staff there will give 3 separate kind of tickets. Blue colored tickets: These are for everybody else and are at the standard price (as of date of writing). Every ticket will also have a BINGO number written on it. There will be a small stall setup in the corner selling JKT48 goods and merchandise. For an idea of the goods list, most of the stuff sold there are also available at http://jkt48-official.shop.rakuten.web.id/ with the exception of specific Rakuten-only items. This stall will be closed once the final performance of the day has started so make sure to shop before then. After ticket collection, you will have to wait for the Bingo order allocation which will happen 45 minutes or so before the show starts. If you are wondering what BINGO is, it is when staff scramble sheets of papers with numbers in a box, and then randomly pick up these sheets one by one and call out their number. Ticket holders with this number can then enter the theater.The staff will repeat for the next number and so on. You will know when Bingo is about to start as all the ticket holders start to enter and stand at the waiting area of the theater. Firstly, staff will call out for Super Far ticket holders to enter the theater.They do not have to wait for the Bingo process and can go into the theater and sit at the reserved third row of the theater. After this, staff will start the Bingo for the Green colored tickets. So, if you have a Blue ticket, stay out of this Bingo, and wait outside of the theater for Green’s turn to finish. You can notice it is Green’s turn if everybody at the waiting area starts holding out their green tickets. Once most or all the green ticket holders are inside, the blue ticket holders can then move into the waiting area and wait for their BINGO turn. During this BINGO process, ticket holders usually line up from left to right in rows representing their numbers. So for example, ticket holders with number 1 will be at the most left of the waiting area, while say, the last number, 15, will be at the right most of the waiting area. So, keep a lookout for other people in your row and stand together. Once your number is called, follow your line and enter the theater. 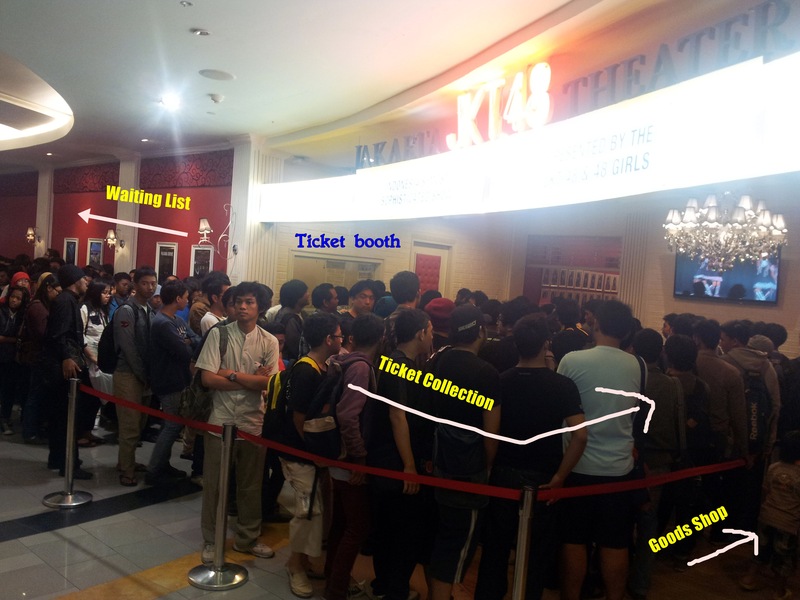 Once Bingo ends, those in line in the waiting list, starting with the girls queue, will then be offered to buy the uncollected tickets at the ticket booth and then proceed to enter the theater. They will usually take up the remaining seats and standing area in the theater. There will be no more entry into the theater once all the tickets have been sold. a) Previously, the staff would write the BINGO timings on the ticket itself and also neatly organize the rows of people from the first to the last number in the waiting area but recently, they have stopped doing this. As a result, the situation can be quite messy and confusing for first-timers. b) Because the staff will mostly speak in Bahasa Indonesia, it helps for you to learn how to recognize some simple numbers in Indonesian for the Bingo. But, even I can’t hear the staff properly sometimes, so do try to ask your neighbors waiting with you, or even the staff, for help. c) The staff at the ticket booth will write the BINGO numbers on the tickets in batches. So, someone who collected a ticket at 11.30am may get Bingo number 1, but another person who collected at 12.45pm may get Bingo number 14 for example. As a result, if you want to sit with friends, make sure you queue together when collecting your tickets. It also helps to ask the staff if they can give your group the same Bingo number too. d) I recommend those with Super Far tickets to try and stand at the front so that they can hear and see the staff calling out for them (and not miss their entry timing). e) As long as your number has been called out, you can show your ticket to the staff and enter the theater (even if you missed hearing it the first time). f) Sometimes, experienced theater-goers with blue tickets simply arrive at the waiting area 25-30 minutes before the show start (instead of waiting for the green bingo to start 45 minutes before the show start). g) Most overseas fans will receive Blue or Super Far tickets. Remember to bring your passports for easy verification at the ticket booth. After Bingo, you will be allowed into the theater area. There will be a bags security check at the entrance to the stage area. Food and drinks are not allowed from this point and will be removed if found in any bag. This is also the place to hand staff any presents or fan letters you have for the members. Below lies my almost laughable attempt at drawing a picture of the stage, It is still not perfect but I hope it’s able to show well enough. As you can see, green and blue ticket holders have specific seats and areas assigned to them. As a result, at this point of time, most of blue ticket holders cannot sit at the green area, unless there is extra space there at the time everybody has entered. As mentioned before, Super Far ticket holders will sit at their reserved third row. 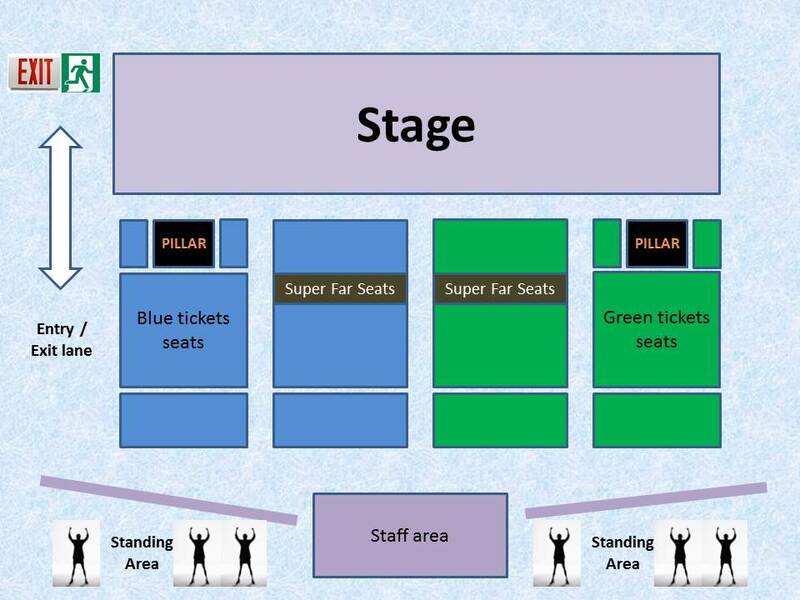 There are also 2 pillars to take note of when you choose your seats around the area. Sometimes, the last two rows will also be reserved for VIPs or invited guests of the show. Well, that’s it! Enjoy the show! The local fans have also come up with their own rendition of the mix (Urya oi, anyone?) which actually sounds better now because most of the chants are still kind of united. Nonetheless, it will still be a culture shock especially if you are used to the usual 48 mix. After the show, there will be either a hi-touch (for Team J) or a handshake (team KKS) to allow the members to thank viewers for watching the theater. This is also the best time to say a kind word or two to your favorite members. 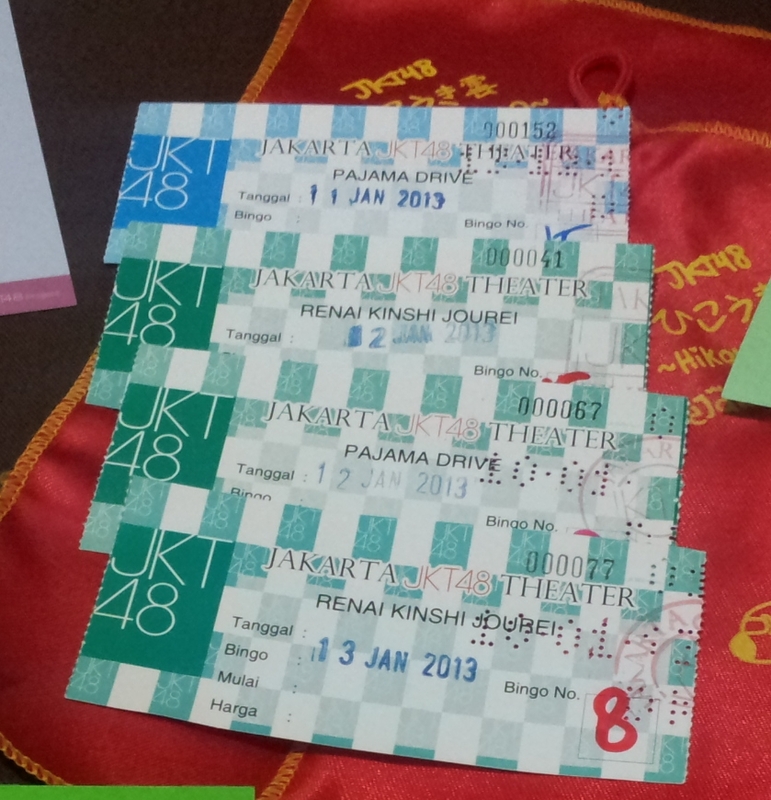 Well, this marks the end of Part 2 to the guide of Watching JKT48. The next part would describe a few of the things you can do to spend your leisure time in Jakarta (and a bit more about f(X)). If you have any thoughts or tips to share about this guide in watching JKT48, do let everyone know through the comment section below. I would also appreciate things to do, places to visit, or good food to recommend, for the next part of this 3 part series! So do comment on it below and we’ll see if we can put it up on the next article. If you feel it is helpful, do share with fellow overseas fans or first-timers too. Cheers and thank you for reading. It is by far the most comprehensive and easy to understand theater map I’ve ever seen. Thanks Ros for the amazing guide! oh, by the way. six to eight seat in the rearmost row usually reserved for media who come to to cover some news about the theater, three to four seats in each area. But, if the overture has almost started and nobody sat on it yet, feel free to use it. I have 2 things to say from my experience. I went to theater 2 times. 2nd time I go&back there by TransJakarta. Get down at Stadium and walk. 1st time I go there by Ojek, and back from there by my friend’s motor bike. When I go there,I ride Ojek at Gambir station. But that driver doesn’t know about FX. So I get down at Stadium. As you know, I’m football crazy, haha Watching stadium for a while, then go to FX. Next I ask young mother with children way to FX. She is embarrassed,so I tell her ”Shopping mall” by English. She nodded “Oh! !” and tell me the way…BUT!! I arrived Plaza Senayan instead …………………….. I ask both by Bahasa(except word shopping mall) , so maybe my Bahasa isn’t perfect? But I also show them picture of FX. Finally I ask guardman at Plaza, he tells me the correct way to FX. So,from my experience, FX isn’t so famous. And before I go to Indonesia, I studied Bahasa. So,I remember numbers 0 to 19. At theater Red and other my friends help me. But unfortunately my ticket number is different from theirs. But I remember numbers, so I can enter when my number called. So, WasshoiJ says at that article ”learn simple numbers help you” , that is clearly right!! for your information about jakarta. you have to prepare yourself physically and mentally before going to Jakarta because you will have to face with : hot weather, pollution, and traffic jam. do not worry about food in jakarta many restaurant that sell food from various countries. Indonesia has hundreds of traditional foods. you can see some Indonesian traditional food on this site http://travel.cnn.com/explorations/eat/40-foods-indonesians-cant-live-without-327106. You should try : nasi goreng, sate, rendang, bubur ayam, gado-gado, and martabak. You can write the name of the food and see the more pictures on google, I hope you are interested to try it after seeing food picture. Just make sure you don’t get excess baggage charges for overweight baggage. I hope you get a fun new experience in jakarta. Previous story JKT48 Single in Three Days?